Once again, I broke up with New York. It’s an on – off relationship: my love affair with the City tends to grind to a halt by the beginning of July. Now that I am away from it all, I do get occasional intense longings for the rumble of the elevated tracks, for sleepy afternoons spent in Sunset Park (the Chapultepec of New York) lounging on grass, for the quiet calm of Hasidic shabbos, for feasts on baklava and meze in Bay Ridge, for drinks at the corner of Havemayer & Grand followed by crossing the Williamsburg Bridge on foot in the velvety darkness. Nevertheless, despite all the potential delights of summer in the City, swapping the cloying humidity, the annoying drone of A/Cs, and sidewalks festering with garbage for the cool endless pastel-hued Nordic nights is a no-brainer. Everyone who ever ventures to Finland in July will encounter strawberries. Mounds of them: hulking layer cakes of heavy cream and strawberries. Strawberries for breakfast, strawberries in salads, strawberries with the afternoon coffee, strawberries as a midnight snack. Friends who drop in for a surprise visit will bring you a punnet of strawberries. And you will surprise them with dessert of strawberries – for years and years, my most low-effort version has been a cup of hulled and halved strawberries marinated in the fridge with half a tablespoon of high-quality aceto balsamico and one tablespoon of sugar. My co-worker’s father has a strawberry farm near Lohja. Today marks the end of their strawberry picking season. Although strawberries from Suonenjoki will still be abundantly available for a few weeks, I really should get started with my strawberry recipes before it’s too late. I’ll travel to Australia for a brief work-related thing next month. The logistics have been unusually complex – there are five people involved and each person has different schedule requirements. This probably explains why I have baked a pavlova (probably the most famous culinary invention from down under) for three separate sets of guests this week. The recipe for pavlova has been with me for at least a decade – it’s always an enormous hit and the perfect party dish. In frenzy of a few minutes, your guests will devour every last crumb, and you will get thank-you notes, e-mails, and text messages that wax poetic about your choice for dessert. It is imperative that you prepare the meringue yourself the morning or night before. You can bake several meringues at once, although I have never been able have them around for longer than a few days. In theory, you could go to a store and buy some readymade meringues. Unfortunately, they will have the texture and taste of drywall. This is because a pavlova is not a dish that travels well: your homemade meringue will be so fragile, yet so deliciously chewy inside that it barely survives from the oven to the table. Pavlova is a tremendously simple affair: once you have amazed yourself by performing true kitchen magic by producing a perfect meringue, you will just pile a lot of whipped cream and fresh fruit on top of it. My favorites are simple and perennial “? either pomegranate seeds or a few passion fruits: both will produce a miraculously pretty dish. Fresh raspberries would also work beautifully, but right now, strawberries are the one and only correct answer. If at all possible, bake the pavlova directly on the serving plate (you can line it with a circle of oiled parchment). You can also use an oven tray, but remember that moving the meringue around will crack it very easily. Beat the whites of eggs with the sugar until hard peaks form (a Kitchen Aid mixer is ideal for this task). Add vinegar and vanilla, and continue beating for 4 more minutes, or until of thick and glossy in consistency. Lightly fold in cornflour. Pile mixture into one large or two smaller circular shapes on the oven tray, making a hollow in centre for filling. Note that the mixture will swell during cooking. I have a gas oven: I bake the meringue at 150 C (300 F) for ten minutes. Then I turn the oven to 140 C (180 F) for a further hour if there is just one enormous meringue; if I make two smaller ones, 30 more minutes is sufficient. Then I turn the oven off, and leave the pavlova in the oven until cool. Undercook rather than overcook – the meringue should remain brilliantly white (if it starts to gain color, the oven is too warm), hard on the outside and meltingly soft inside. Top with whipped cream and decorate with fresh fruit. Serve immediately. No oli jo aikakin :) Tervetuloa Suomeen. Thx Polkkis! Although I love Helsinki in the summer, I’m packing my stuff right now for a week of aimless driving around Eastern Finland. Juankoski, here I come! Glad you’re back. Do I understand the longing feeling for a place where you are not currently… Helsinki in July… Well, Juankoski is not bad either. Have a great time! Hey! I discovered this blog few weeks ago and I was waiting for some new posts. Nice to read yout! I’m myself french woman living in Rovaniemi and also have my own blog which is mainly about food, finnish food! I’m so happy to see you blogging again. 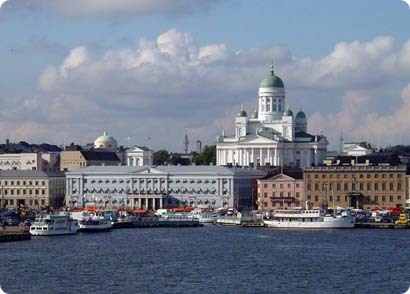 Finland is one of those countries that I would just love to visit. But now I must change my plans so that I visit in July. This way I can enjoy the strawberries. Hi Anna, I’m so glad you’re back!! Hi Eszter, Ivonne, Zsofi & Rachael, I’m so happy you are stopping by – sorry we have been so negligent about posting lately. Both Antti and I have new jobs that keep us incredibly busy. On the other hand, returning to Finland means that I will be cooking more than ever – takeout isn’t as great here as it is in Manhattan and restaurant options in Helsinki are pretty limited. Joey, have no fear – meringues look really daunting, but they are super easy. The only trick to it is to keep the oven cool enough. Charlotte, I recently found your blog too and it is wonderful: the pictures are simply mouth-watering, you have a fresh take on Finnish favorites, and I get to practice my (pretty non-existent) French. Keep up the good work! when i was making my traineeship in Lappeearanta (LUT) i had the chance to see your nice Country , kind people and also tasted delicious strawberries. you wrote baklava and meze as we write and say in Turkish. if you tried a meze recipe before it will be nice to read it from your blog . A pavlova is an instant winner I think.. made a raspberry one for Valentine’s and your comment about baking it on the serving plate is spot on… I had no baking paper to hand and messed about with tin foil which does not work well. Sauce tip… raspberry and passion fruit… 100 grams of raspberries and two/three passion fruits.. in the blender and then through a siff.. lovely.